Adjust your tracking. Adjust your life. 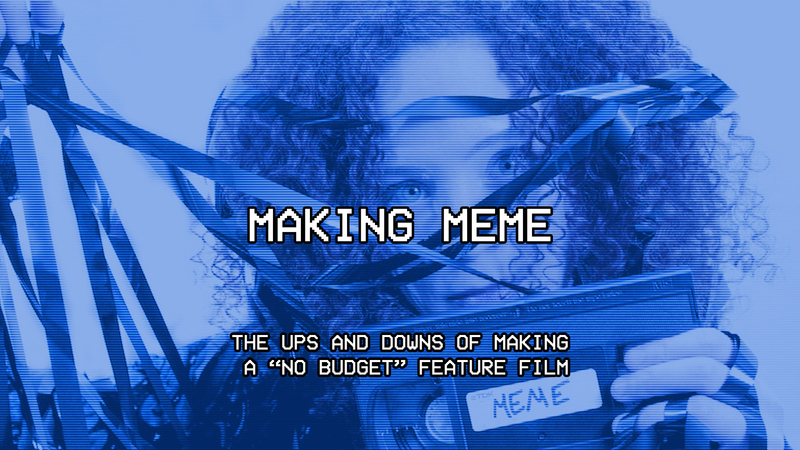 Meme’s Kickstarter ended unsuccessfully in October 2013. It was a bit of a blow. Filmmaking is personal. Putting yourself out there and asking for support is very personal. When it doesn’t work out it can feel like it’s a judgement on you personally. As I said in my previous post, in reviewing the reasons the Kickstarter didn’t work out I knew it was because, ultimately, I wasn’t ready to make the film and I’d rushed ahead. So, I decided to make myself ready to make the film. The first step to recovering from the blow of the unsuccessful Kickstarter and the first step to making myself ready for making Meme was to get back on the horse. I needed to shoot and I resolved to shoot as many projects as I could. Almost immediately after the end of Meme I got together Sarah Schoofs, Kitty Ostapowicz, and Ashley Jordan to shoot “Metatron.” “Metatron” was based on an idea I had for the backstory of a poster used in the background of “Abel and Cain.” Katie Carman-Lehach, who had been producer of Meme at the time, produced the short and helped shoot some of the effects shots. We shot and finished the film quickly with the intention of screening at the IndieWorks Halloween show a few weeks later, which we did. That project was followed by shooting the “Ione” series of short films with Kitty Ostapowicz and Sarah Schoofs of Meme. I shot A Change of Expression with Kitty Ostapowicz to submit to Vimeo’s Weekend Project. I shot a Videodrome tribute, “O’Blivion,” with Sarah Schoofs to continue working through the video themes I’d been working on in Meme and experiment more with Adobe After Effects. I outlined and scripted some ideas for more projects and a couple of web series that I ultimately didn’t make. I worked on rewrites of Meme in between the other projects. In early 2014 I came up with the idea for “Time Signature.” “Time Signature” started as a tweet. A joke. I occasionally write ridiculous movie premises on my twitter. Just for fun. This one didn’t turn out to be so ridiculous. It was a solid idea that seemed like a good opportunity to put Kitty Ostapowicz and Tara Cioletti, two actresses I enjoy working with, together in a project. I recruited Director of Photography Peter Westervelt to shoot the project. Then I chose to jump back into crowdfunding again. Less than a year after the unsuccessful Kickstarter for Meme. I learned from the experience of crowdfunding for Meme and the “Time Signature” campaign went much better. I used Seed&Spark instead, which lead me to that community. When attending one of their Crowdfunding for Independence Workshops I met Carolyn Maher. Carolyn later joined “Time Signature” as the Assistant Director. We shot “Time Signature” in June of 2014 and soon after I began talking with Carolyn about Meme. Early in 2014 Katie Carman-Lehach’s work situation and availability changed. We had been discussing the future of Meme in meetings for months but she wasn’t able to continue giving the project time and we parted on the project. She was an integral part of the early development of Meme and her work and support are greatly appreciated. After the end of “Time Signature,” though, I was eager to jump back into Meme and I needed the help of a Producer. Carolyn Maher had been an incredible asset on set for “Time Signature.” So, I asked her if she’d be interested in helping me make Meme a reality. Carolyn agreed to read the script for Meme and ultimately joined the project. Meme evolved throughout this period. At various points I was planning to shelve the project, search for investment, and try crowdfunding again. I rewrote the script again and again. I gutted it and rebuilt it. Where before the plot had involved a cult I instead grounded the story in more personal and recognizable struggles with dependency. As I turned back to the idea of shooting again it took shape as a more focused story. The nonlinear narrative was rearranged into something more straightforward (later changed again to nonlinear then we got to post, but we’ll discuss that in the future). Some scenes remained virtually untouched from early drafts. Other characters and subplots were excised entirely. I took the opportunity to find the core of the story and make sure we were as focused on that as we could be.